The acceptance and inclusion of a new employee is an important part of the employees progression in the company. As a manager or boss you want to help your new employee or employees fit into the structure of your business quickly and efficiently. The more comfortable an employee feels within their company role the more efficient and productive they will be in the tasks they undertake. The way to ensure a new employee is happy and comfortable is to encourage your current workforce to interact with them. Make sure the atmosphere is welcoming and friendly. Incorporate some fun ice breaker games into the daily work routine. For instance before a meeting or work event you could include a couple of quick and easy ice breaker games to introduce your new employee. 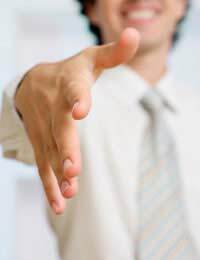 Ice breaker games should include everyone and not single out the new employee as this can make them feel more distant than they already feel. This is more of a get-to-know you exercise rather than a game but is probably the most effective, not to mention quick, method of introducing your team. Rather than make your new employee stand up in front of the group and talk about their lives for 20 minutes place a chair at the front of the room and allocate one of the team to sit in the chair. Then instruct the group to fire questions at the person in the chair. The group have 3 minutes to ask as many questions as they can. Make sure everyone in the team sits in the chair. When it comes to the new employee you can give the group 5 minutes to fire questions as they won’t know as much about the individual as the rest of the team. This quick and simple game gets everyone interacting and helps the new employee learn about the group and visa versa. This simple game helps everyone find out aspects of each others lives that they may not already know. Hand out 3 pieces of paper and instruct every participant to write 3 statements about their lives that the group may not know. Once everyone has written down their statements ask them to place the 3 bits of paper in a container, e.g. a hat or box etc. Then, the organiser (or boss) picks out a statement and reads it to the group. The group then have to guess whom the statement belongs to. Carry the game on until everybody has been matched with his or her three statements. This game is a lot of fun and allows the new employee to share facts about themselves. This game requires a beanbag or softball. Instruct the group to form a circle (sitting in chairs or standing up is fine). Explain that when someone is throwing the object they must call out the persons name they are throwing it to. For example, John calls out Kelly and immediately throws to Kelly. Once the ball has been caught the next person calls out a name and throws to that person, and so on. Make sure the game gets quicker and quicker as it progresses as this adds a little fun to the game. This is a simple game that helps everyone remember each other’s names quickly. Remember, when including a new employee into your team ensure that they have plenty of support and interaction, as without this the employee can quickly feel uncomfortable and isolated.